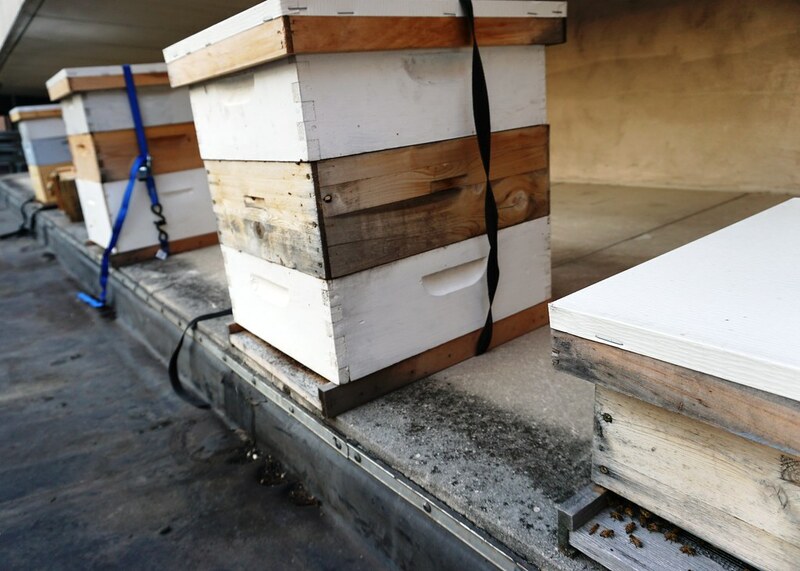 Approximately 100,000 Honey Bees Call the Sofitel Philadelphia Roof Garden Home. The City of Brotherly Love can thank William Penn for the pockets of green spaces and Sofitel Philadelphia for a roof garden buzzing with honey bees. Atop the 14-story hotel in Center City is a working garden with a collection of herbs, strawberries and more than 100,000 honey bees. According to Ms. Angela Bauer, the hotel’s general manager, the roof garden was planted about six years ago and the honey bees were added about three years ago. It’s currently one-of-a-kind in Philly and the garden is a symbiotic relationship between bees and plants. The plants need the bees to pollinate their blossoms and the bees need the pollen nectar from the blossoms to eat and the nectar becomes honey. 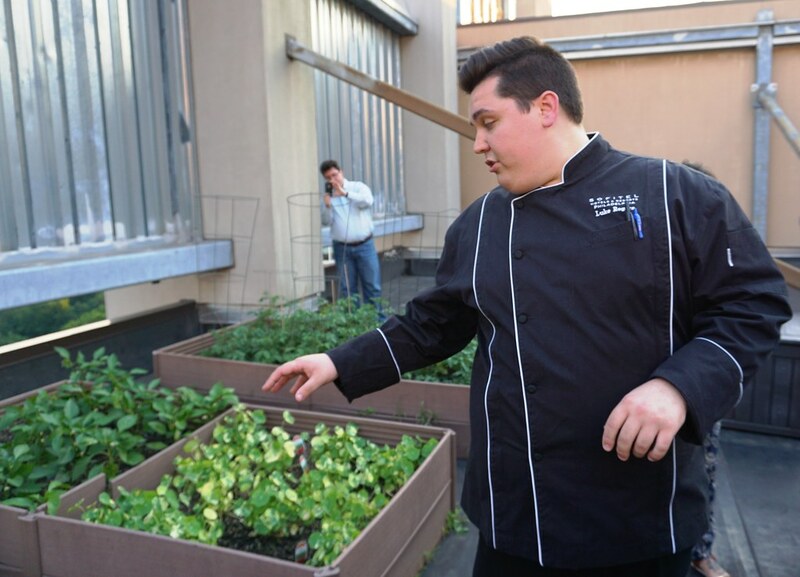 Chef Luke Rogers at Sofitel Philadelphia Points Out Various Herbs at the Hotel’s Rooftop Garden, June 2016. 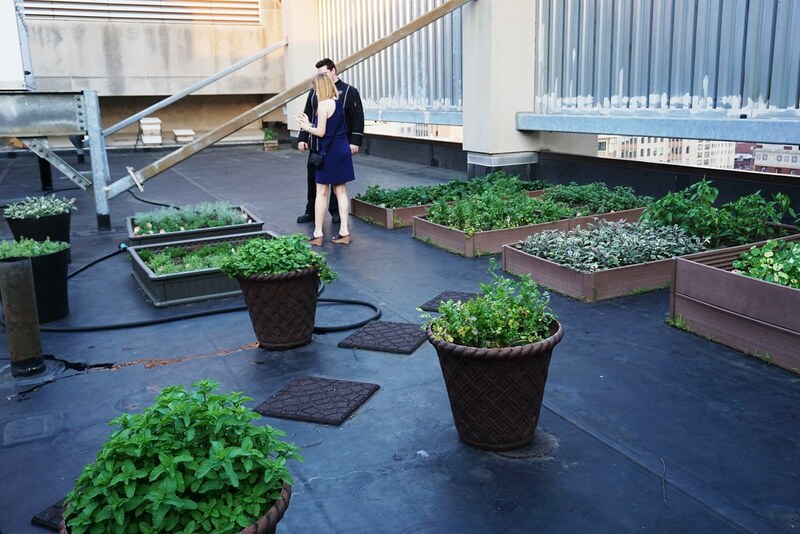 Sofitel Philadelphia’s chef Luke Rogers harvests the herbs and strawberries from the seasonal roof garden and incorporates the fresh ingredients into dishes served at the hotel’s Chez Colette restaurant and Liberte Urban Chic Lounge. About eight gallons of honey is harvested annually from the Italian honeybees (the particular species is hearty enough to hibernate and withstand Philadelphia winters and the beekeeping experts harvest the honey, not the hotel staff) and is used in recipes as a sugar substitute, in sauces or vinaigrettes, or in desserts crafted by the pastry department. 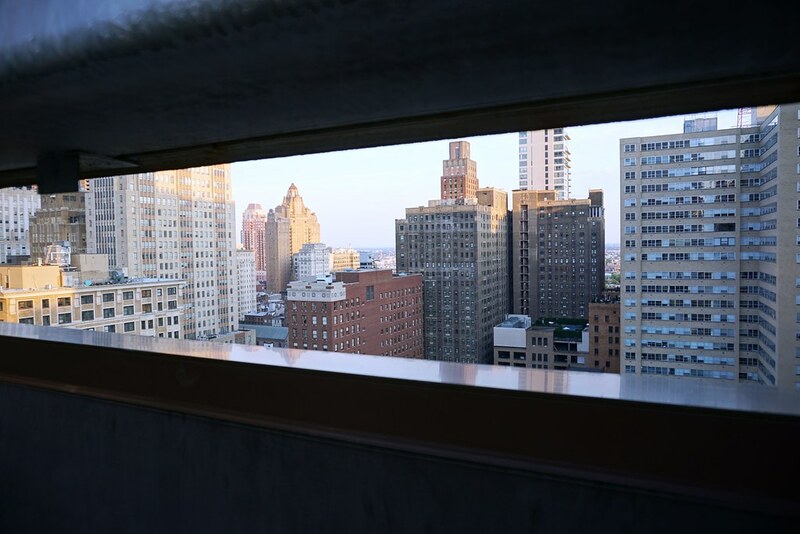 The hotel’s roof garden is off limits to guests and I was provided special access during an intense travel blogging workshop in Philadelphia called BlogHouse in June. Chef Luke pointed out the various herbs which included basil, thyme, Italian parsley and nasturtiums (edible flowers) and encouraged my group to sample some of them. What’s the Buzz? Honey Bees! Personally, I was fascinated with the amazing view of Philadelphia and the five honey bee hives which sat at the opposite end from the garden. And no, I didn’t stick my finger in a hive to sample the honey; I’ve read the Winnie the Pooh books. Sofitel Philadelphia’s roof garden is not the first hotel garden I have seen but it is the first with a spectacular view and one with honey bees. What’s the big deal about honey bees? They’re important pollinators for crops we rely on. By having this garden, the hotel is contributing to the community’s well-being. One of the cocktails I enjoyed during a visit to Liberte Urban Chic Lounge is called the Honey Bud and is made with dark rum, ginger, orange, lime and honey from the rooftop bees. It was a beautiful blend of sweet and slightly tart but very smooth. Another cocktail using a rooftop ingredient is called Val’s Garden, made with Uncle Val’s gin, St. Germain, muddled basil (from the Sofitel Philadelphia’s garden) cucumber and lime juice. In addition to everyday freshness, Sofitel Philadelphia celebrates special culinary occasions throughout the year. 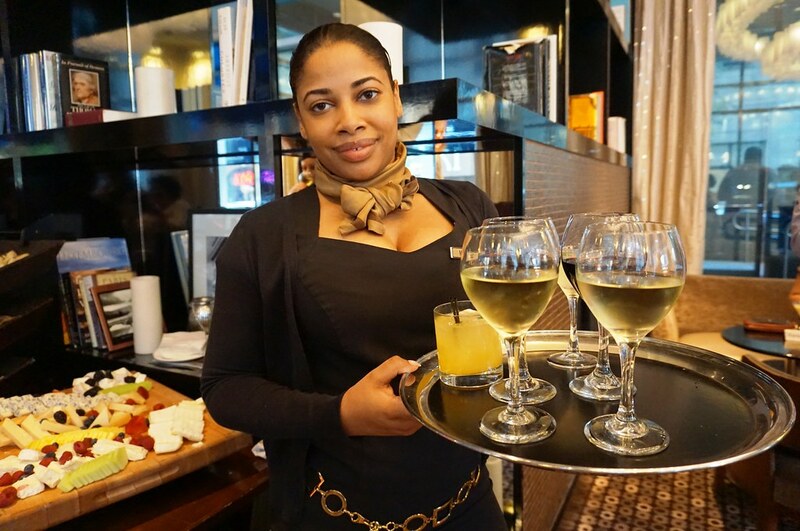 For instance, September is Sofitel French Wine Week which includes French wine pairings. Special menus are prepared for national days as chocolate, bread and cheese. A hotel that cares for its culinary craft as much as it cares for its guests is pretty sweet in my book! Are you a foodie like me? Then you may enjoy one of these culinary adventures with Intrepid Travel. 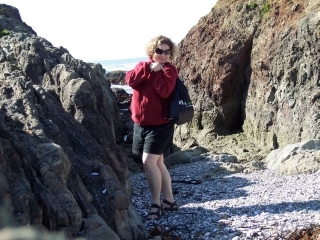 Disclosure: This post contains affiliate links to support my traveling habit and this blog. I was a guest of Visit Philadelphia during my June 2016 visit to the City of Brotherly Love however, opinions are my own. 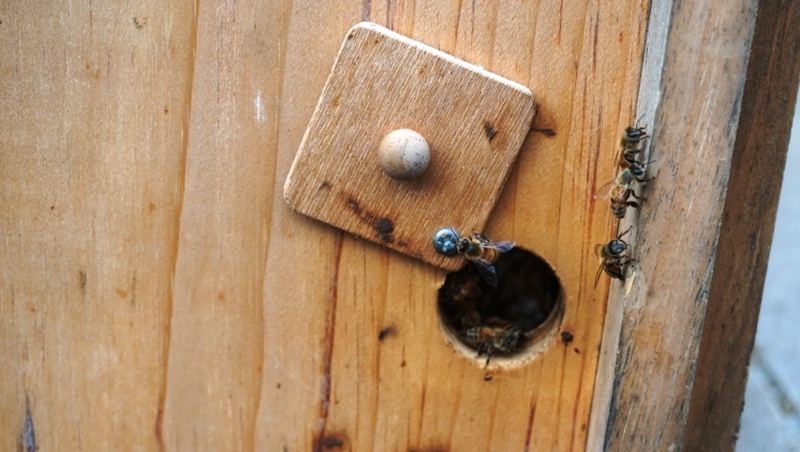 Great write-up on the Sofitel Hotel’s rooftop honey bees, Jennifer!